Playing on your phone might be taboo while out to dinner, but more people are pulling out their mobile devices to snap and share pictures of meals and update their Facebook statuses, a new study suggests. According to an infographic by market research firm Lab42, about 19% of those that use their smartphone while at a restaurant update their status on Facebook. Meanwhile, about 24% said they take pictures of their entrees and 18% check-in to the restaurant on services such as Foursquare. Not surprisingly, smartphone users (20%) are also communicating with others to make dinner plans and 19% use mobile devices to find nearby restaurants. 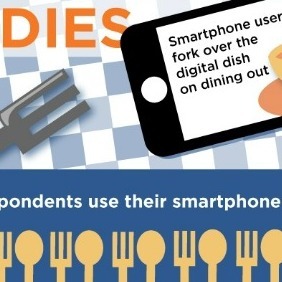 Meanwhile, about one in five people who use their smartphones during their dining out experience do so to view a menu online and find directions.